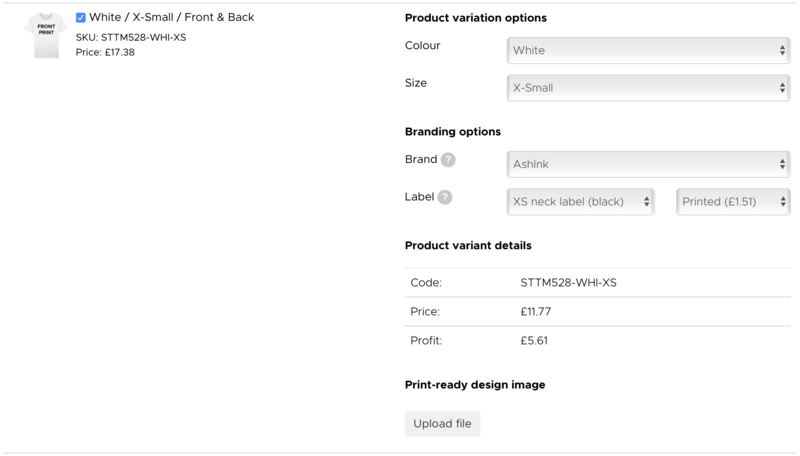 It's not always the case, but in some circumstances you might find that the print file you've uploaded to your product isn't suitable for each variation, or you may want to add an extra variant options to your product to allow customers to select from multiple print position options on the same product page. Many customers stick to one colour of garment per design, so only one print file is needed, but what if you'd like your design printing on both a black and white t-shirt, for example? The print file you've uploaded for your white t-shirt will not be suitable to be printed on black, so you'll need to assign a different print file for these variants. To do this, first log-in to your Shopify store, open the Inkthreadable app and click the Link Products button. Click the Edit button next to the product you'd like to upload additional print files to. If you scroll to the bottom of this page you'll find the print file that's currently assigned to each of your variants. This can be left as it is - any print files added to your variants will override this file, but the variants that don't have any uploaded will default to this file. Scroll back to the top of the page. Working from the top of this page you can start adding print files to any variants that require one. The design for this product is black, but since black can't be printed on black we'll need to upload a print file that's a different colour. White will contrast perfectly. In the Inkthreadable product column, for each variant, there'll be an Upload button under the heading Print files. Click this button and upload the file you'd like to be used when this variant is printed. Repeat this process for each variant (remember, any variant that doesn't have a file assigned in this way will default to the original print file) and when finished, click the Save button. Your product will now be updated, and all variants will be printed using the print file you've uploaded. It's also possible to offer two print positions, so both a front print or a front and back print for a product, on the same product page. Please note: adding an extra print to a product increases the production cost, so make sure you price any variants that offer a front and back print accordingly. 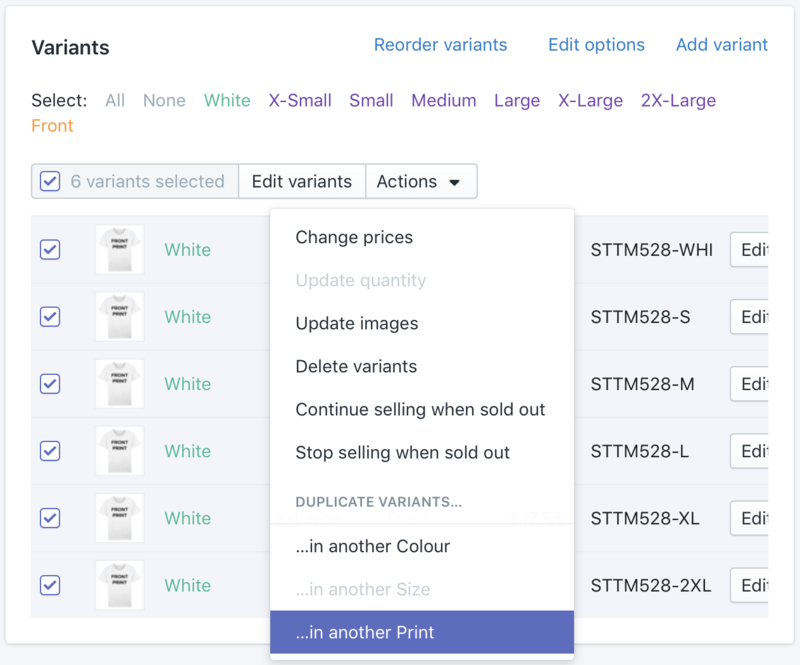 You'll need to add the right variant options in Shopify. 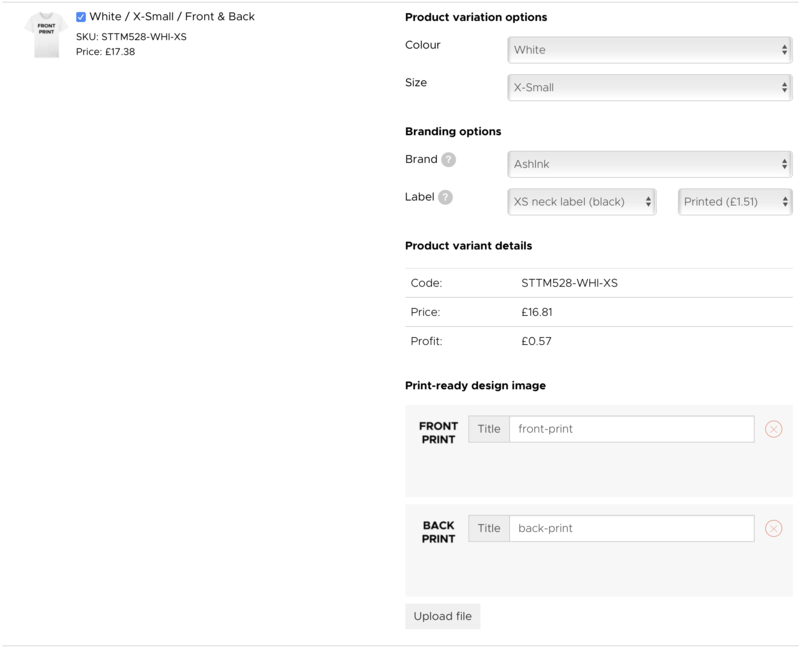 Head to Products in your Shopify Dashboard and add a new variant option for 'Print'. You can name this anything you like, it's just having the variant option that's important. Once you've added the new option for 'Print' it'll automatically apply this option to all current variants. The next step is to duplicate all current options in a new Print option, so select all current variants, click Actions and then under 'duplicate variants...' select ...in another Print. The initial Print option was 'Front', so the new Print option should be 'Front & Back' so that both print options are covered. Once completed, and if you exported from Inkthreadable, if you head to your Shopify Preferences and locate the product you'll see that it's 50% linked. If you create the product in your Shopify store it won't be linked at all, but that's okay. The next step is to link all variant options as detailed in this guide to make sure all variant options are linked correctly. Please note: If you're using DTG labels, check the labels of any variants automatically linked by our system. 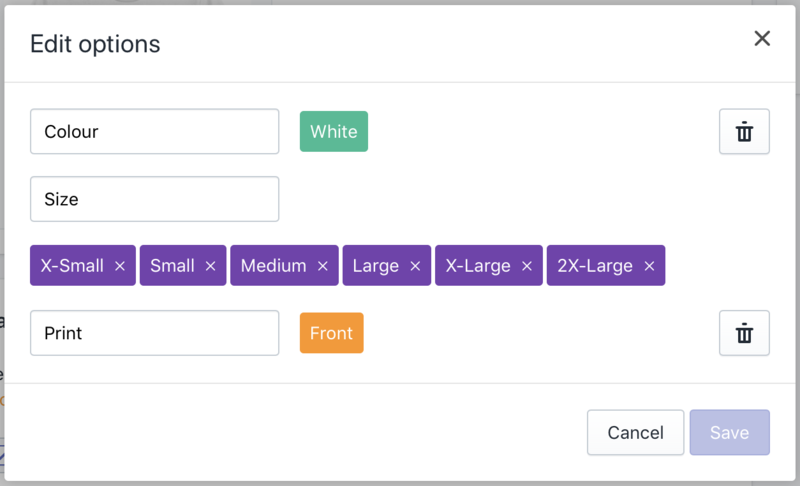 Labels are not assigned automatically by size, so if you use different labels for each size you'll need to assign these too. Once you've linked all variants correctly your product will be 100% linked, but there's still your artwork to deal with! Click the Edit button and scroll down to the very bottom of the page. If you didn't export your product from Inkthreadable you won't see anything here, but if you did you'll see a print file has been linked automatically. This print file is the default print file for all variants of this product. If there isn't a print file here, upload the print file you want to use for each variant that will only have one print. In this case it's the front print file. The final step is now adding print files for all variants that are having both a front and back print. Scroll back to the top of this page and find the first product variant that's using your new 'Front & Back' print option. Towards the bottom of this variant listing you'll see 'Print-ready design image' with an option to upload a file. You can actually upload multiple print files here, and this is how we'll add both a front and back print to this variant. Adding print files here overwrites the print file assigned at the bottom of the page. You can click the Upload file button, navigate to your files, select multiple and upload, or drag and drop your print files from your computer. Either way, upload both your front and back print files to this product variant. Helpful tip: Please name your print files front-print or back-print so we know which print file is to be positioned where. Work your way through each variant with the 'Front & Back' print option and assign both print files to the Print ready design image area. Once completed, save the product. And you're done! Updating your print files won't add the corresponding product mockups to your product page. You'll need to do this manually. Once you've downloaded the necessary product mockups to your computer, log in to your Shopify store, head to the product page for the product you're editing and upload your files to the Images box.